Like things that are free, or inexpensive? 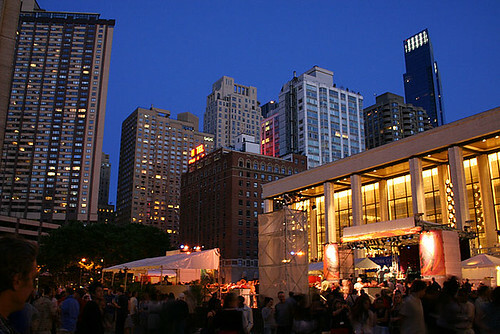 Well do I have the thing for you, Midsummer Night Swing at Lincoln Center, a perfect combination of all three. Last week after work, I was strolling down Broadway minding my own business and snapping pictures when I heard music. So I did what any self-respecting camera carrier would do, I followed the sound, hoping to find a photo op like a pot of gold at the end of a rainbow. 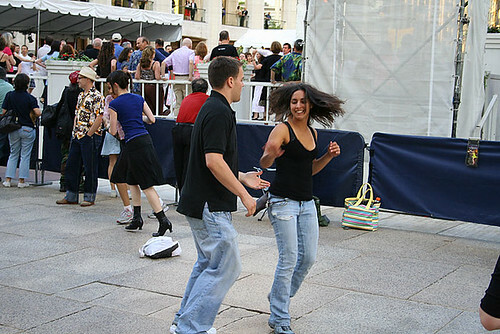 I rounded a corner and scanned the Lincoln Center Plaza and was pleased to find a crowd milling about, a dance floor set-up, and people learning how to swing. Last year I stumbled upon this same scene except it was Latin Night and everyone was dressed up in spangles and sassy skirts and learning to cha-cha and mambo. This night, they were learning how to swing. Lyndie style. I love swing dancing. I can Triple-step, Jive, and West-Coast (my favorite) with the best of them. But I’d never really learned to Lyndie. It was fun to watch everyone learn the basic steps and fumble through the moves. People of all ages were laughing, twirling, and having fun. Even the pregnant lady was dancing, and boy could she move! The good thing about Midsummer Night Swing, it will continue for almost a month. 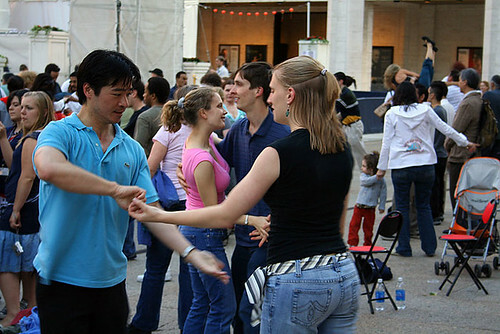 From June 19th-July 23rd every Tuesday through Saturday night, there will be dancing at Lincoln Center. Check the schedule here. 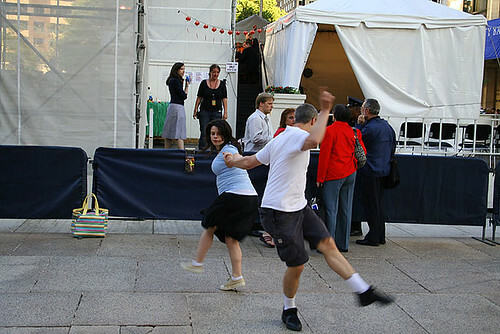 If you want to pay $15, you can dance on the dance floor, if you don’t, you can dance on the plaza. If you don’t know how to dance, but want to, come and learn. Show up at 6:30 for the nightly instruction. 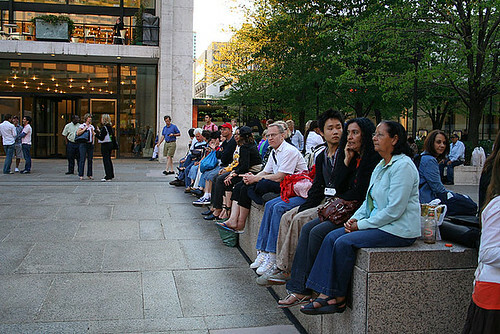 And if you just want to listen to great live music, show up early to grab a spot to sit and watch, or plan to mill around the crowd (7:30-10:00). What kind of dancing will there be? Well tonight is country night, so come prepared to dance some Western Swing. But through the 23rd there will be everything from Ballroom, tango to the waltz, to Salsa, Swing, and Two-Step. They even have a Rock and Roll night, although I’m not quite sure what kind of dancing that will be. 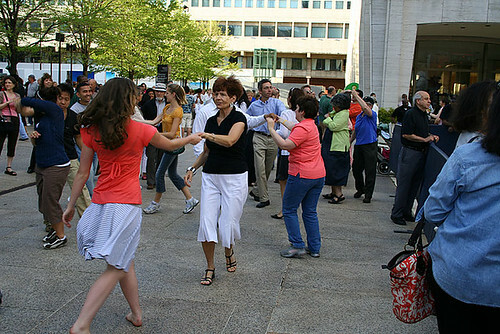 Check the calendar of events and come enjoy your NYC summer nights by dancing the night away. I would be SO there!!! I got several shots of the pregnant woman and her partner. They were dancing up a storm, and were pretty good, but I liked this shot them best. For those of you who can't read through the orange, Donna said. I would SO be there!!!! I wish I was there - looks like a terrific time! I miss NYC. Thanks for getting out and about and snapping the pics for those of us who can't get there ourselves.